Kadampa practitioners traditionally make offerings and requests to the Dharma Protector Dorje Shugden. The purpose of this practice is to remove obstacles and gather all favorable conditions for their spiritual practice. Heart Jewel, Wishfulfilling Jewel, and Melodious Drum. In Tibet, every monastery had its own Dharma Protector, but the tradition did not begin in Tibet; the Mahayanists of ancient India also relied upon Dharma Protectors to eliminate hindrances and to fulfil their spiritual wishes. Among all the Dharma Protectors, four-faced Mahakala, Kalarupa, and Dorje Shugden in particular have the same nature because they are all emanations of Manjushri. However, the beings of this present time have a stronger karmic link with Dorje Shugden than with the other Dharma Protectors. It was for this reason that Morchen Dorjechang Kunga Lhundrup, a very highly realized Master of the Sakya tradition, told his disciples, “Now is the time to rely upon Dorje Shugden.” He said this on many occasions to encourage his disciples to develop faith in the practice of Dorje Shugden. We too should heed his advice and take it to heart. He did not say that this is the time to rely upon other Dharma Protectors, but clearly stated that now is the time to rely upon Dorje Shugden. 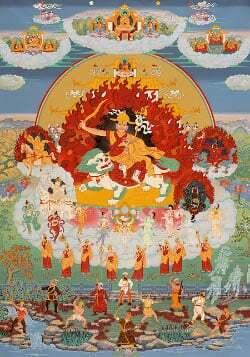 Many high Lamas of the Sakya tradition and many Sakya monasteries have relied sincerely upon Dorje Shugden. In recent years the person most responsible for propagating the practice of Dorje Shugden was the late Trijang Dorjechang, the root Guru of many Gelugpa practitioners from humble novices to the highest Lamas. He encouraged all his disciples to rely upon Dorje Shugden and gave Dorje Shugdän empowerments many times. Even in his old age, so as to prevent the practice of Dorje Shugdän from degenerating he wrote an extensive text entitled Symphony Delighting an Ocean of Conquerors, which is a commentary to Tagpo Kelsang Khädrub Rinpoche’s praise of Dorje Shugden called Infinite Aeons. Some people believe that Dorje Shugden is an emanation of Manjushri who shows the aspect of a worldly being, but this is incorrect. Even Dorje Shugden’s form reveals the complete stages of the path of Sutra and Tantra, and such qualities are not possessed by the forms of worldly beings. Dorje Shugden appears as a fully ordained monk to show that the practice of pure moral discipline is essential for those who wish to attain enlightenment. In his left hand he holds a heart, which symbolizes great compassion and spontaneous great bliss – the essence of all the stages of the vast path of Sutra and Tantra. His round yellow hat represents the view of Nagarjuna, and the wisdom sword in his right hand teaches us to sever ignorance, the root of samsara, with the sharp blade of Nagarjuna’s view. This is the essence of all the stages of the profound path of Sutra and Tantra. Dorje Shugden rides a snow lion, the symbol of the four fearlessnesses of a Buddha, and has a jewel-spitting mongoose perched on his left arm, symbolizing his power to bestow wealth on those who put their trust in him. The single eye in the center of his forehead symbolizes his omniscient wisdom, which perceives directly and simultaneously all past, present, and future phenomena. His wrathful expression indicates that he destroys ignorance, the real enemy of all living beings, by blessing them with great wisdom; and also that he destroys the obstacles of pure Dharma practitioners. If we can understand well the nature and functions of Dorje Shugden, we can understand the benefits of relying upon him. Dorje Shugden always helps, guides, and protects pure and faithful practitioners by granting blessings, increasing their wisdom, fulfilling their wishes, and bestowing success on all their virtuous activities. Dorje Shugden does not help only Kadampas; because he is a Buddha he helps all living beings, including non-Buddhists. The sun benefits even those born blind, giving them warmth and ripening the crops that become their food; but should they gain their sight, how much more obvious its benefit would be! In a similar way, although Dorje Shugden protects even those who do not make an effort to rely upon him, when our eyes of faith in him open and we rely upon him sincerely we will gradually become more aware of the help we receive from him. If we sincerely wish to experience the benefits of relying upon Dorje Shugden, we must rely upon him constantly over a long period of time, steadily improving our connection with him. In this way, we will begin to notice his beneficial influence in our lives. We should understand that the principal function of a Dharma Protector is to protect our Dharma practice, not to help our mundane affairs. Bearing this in mind we should not become discouraged if we do not suddenly become very wealthy, for wealth does not necessarily help spiritual practice and can be a great distraction. If we rely sincerely upon Dorje Shugden, he will arrange the conditions that are most conducive for our Dharma practice but these will not necessarily be the ones that we ourself would have chosen! Dorje Shugden will bless our minds to help us transform difficult situations into the spiritual path, and he will open the wisdom eyes of his faithful followers, enabling them always to make the right decisions. 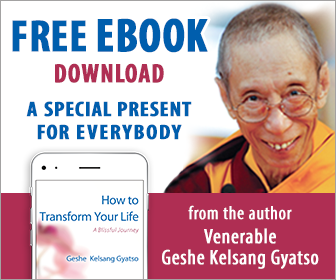 To learn more about Dorje Shugden see Heart Jewel by Geshe Kelsang Gyatso.